To measure the Inlet and Outlet Temperatures, and the flow rate, of the evacuvated tube collector using the thermal oil. To calculate the Efficiency of the collector from exported data. After determining a suitable site with ambient or maximum solar radiation I,e where we have the amount of solar energy ready for use, we would require a suitable method to convert this energy into useful form or products like power generation, hot water, solar air-conditioning. One of the method to do the same is by means of flat plate collector, which absorbs the solar radiation( heat energy ) and the output generated by this apparatus is hot water or hot working fluid, which can be used for appropriate purposes. 2. Transparent cover – Reduces convective heat loss, natural convective air current created because the absorber is hotter than ambient air. This may be also due to the thermal resistance of the added air space. 3. Heat transport fluid - Fluid circulating through tubes(glass or polycarbonate) absorb the heat from the plate, this hot fluid is then utilised for our required purpose. Evacuvated tube collector is not so commonly used solar collector as a flat plate collecor. This is now commonly available technology which is widely used in air- conditioning and other water heating applications. The evacuvated tubes are made from low emissivity borosilicate glass with glass covering on the top and they are coated with aluminium or copper to absorb whole radiation to generate heat. This technology works well even in diffused sunlight. 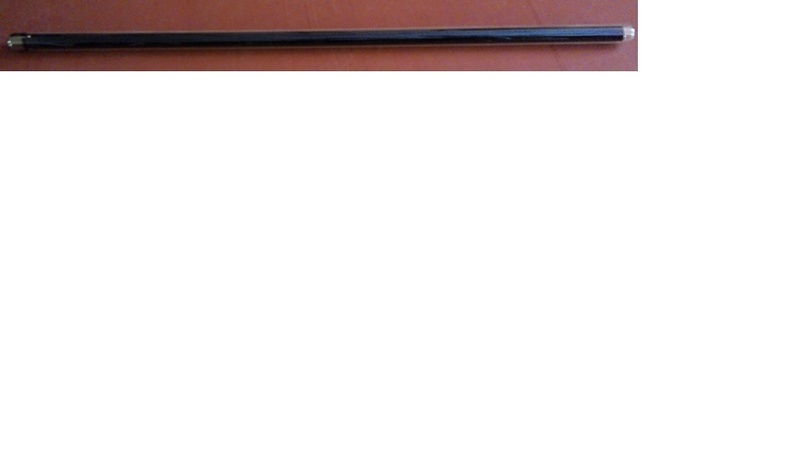 In this type the absorber plate is fused to the tube (Heat pipes) through which the transport fluid flows, making the solar energy absorption direct. 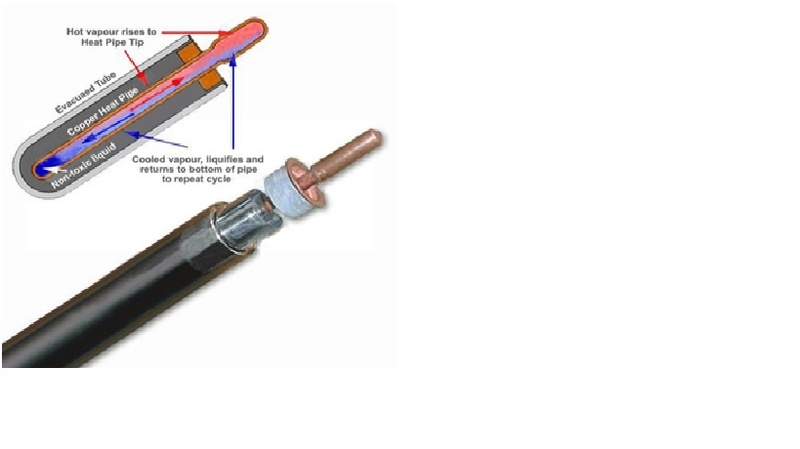 To the transfer fluid the heat is given by heat exchanger of the heating system (manifold). We are using oil- Hytherm 600 as the heat transfer fluid in this experiment. Oil is circulated through a series of these evacuated tubes. When the fluid passes through these narrow copper tubes, it absorbs heat energy from these copper tubes. Temperature of the fluid is thus increased. This fluid Hytherm 600 is recommended in the applications where bulk operating tempartures go upto 305°c even replacing some synthetic products. The fluid has excellent thermal conductivity and oxidation. Exhibits excellent chemical stability. It is non corrosive and non toxin in nature. Flow rate of fluid (oil) can be varied by controlling the pumping pressure of the motor. Inlet and outlet oil temperature is constantly monitored. At any given time, the outlet temperature will be greater than or equal to the inlet temperature. 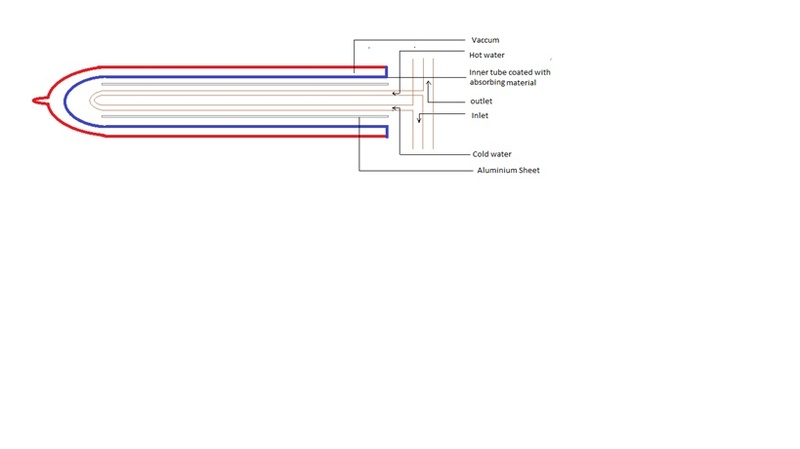 In this experiment, user can vary the flow rate of oil and analyze the inlet, outlet and tank temperature variations. Solar radiation intensity of the location is also constantly monitored, which can impart the user with the insight of the heat energy absorbed by the heat transfer fluid with a given solar radiation intensity. The table above compares certain thermophysical properties of Hytherm 600 and Water. The viscosity of water is less on comparison with the thermic fluid. The thermic fluid has less tendency of being tubulent for the same velocity of flow as that of water. Flow will be almost laminar. The specific heat of the thermic fluid is very high on comparing with the water. It can hold more heat during the flow. Even though the thermal conductivity of the water is higher than the hytherm 600, there is a chance that the water may get evaporated quickly if at very high temperature, ultimatly changing the property of fluid.This may affect the effeciency of the sytem. For any study of the thermal behaviour of the oil circulating in FPC we can use the data obtained from this experiment, that is one could know about the different temperature of oil circulating in the tubes for different flow rate. Solar AC is a great application of the flat plate collector setup. For designing an efficient solar AC we need certain parameters, and some main parameters required for the same can be obtained from the result or observation of this particular experiment. The rays on the right-hand side are reflecting below the focus and the rays on the left-hand side are reflecting above the focus. If the half parabola tilted away from the sun is discarded, and replaced with a similarly shaped parabola with its rim pointed toward the sun, we have a concentrator that reflects (i.e. traps) all incoming rays to a region below the focal point. Since the rays are no longer concentrated to a single point, this design is called a non-imaging concentrator. A receiver is now placed in the region below the focus and we have a concentrator that will ´trap´ sun rays coming from any angle between the focal line of the two parabola segments. Receivers can be flat plates at the base of the intersection of the two parabola, or a cylindrical tube passing through the region below the focus. The name, compound parabolic concentrator, derives from the fact that the CPC is comprised of two parabolic mirror segments with different focal points as indicated. The focal point for parabola A (FA) lies on parabola B, whereas the focal point of parabola B (FB) lies on parabola A. The two parabolic surfaces are symmetrical with respect to reflection through the axis of the CPC.The concentrating ability of the CPC can be understood through the use of ray tracing diagrams. The geometric concentration ratio of a CPC is related to the acceptance angle by 1/(sin(A/2)) where A is the acceptance angle of the CPC. Generally, a collector consisits of a receiver or absorber that converts sunlight to heat and transfers it to water in the tube(s). The collector is insulated on the back to keep the heat transfer losses down. Though, there still exist radiation and convection losses. The following modelling equations are generic, and can be modified to specific Flat Plate or Parabolic collector set up. See Ref 2. for further details. Out of 90% transmittance, 8% energy is lost due to absorber reflection, 6% loss due to absorber emission, and up to 13% in convection losses. Conduction losses through the back of the receiver ot absorber is 3%. This leaves net available solar radiation for transfer to heat transfer fluid at 60% of initially available total solar radiation. 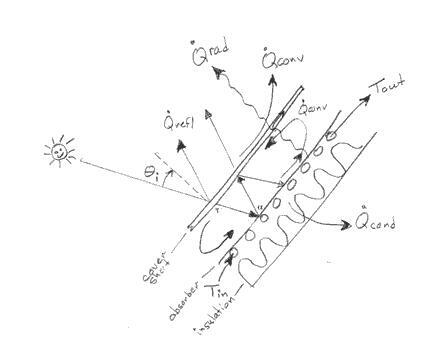 The absorber or receiver (flat plate or parabolic) must have high absorptance in the wavelength range below 2 micron, as the main solar spectrum is in this range. the absorber can heat upto 350K, and this emittance spectrum is higher than 2 micron. Since [alpha = epsilon] , the absorptance should be as low as possible above 2 micron to limit radiation losses. is reduced by losses due to reflection, convection and radiation. where the product of transmittance and absorptance is replaced as the Optical Efficiency of the absorber or collector. a1 and a2 are loss coefficients. Evacuated tube collector loss coefficients arer much lower than Flat plate collectors. The loss coeffiecients are experimentally determined. For a Flat Plate Collector, optical efficiency is 0.7-0.8, a1(W/m^2K) = 2.5-3.8, a2(W/m^2K^2) = 0.007-0.23. 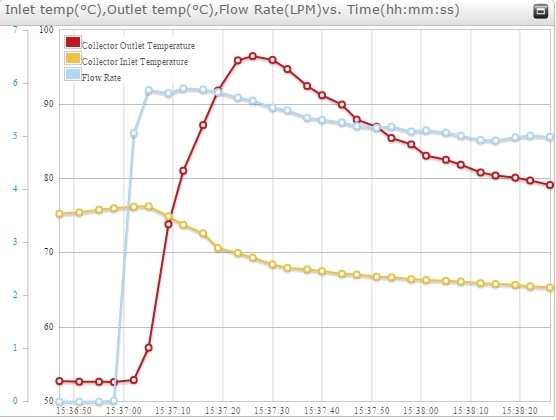 The collector flow rate should be high so that efficiency does not go down from high collector temperatures. On the other hand, flow rate should not be too high, in order to maintain the energy transfer demands within acceptable range. This is the mass flow rate rewritten as a area flux, measured in kg/m^2 hr.